Originally I am a Visual Arts teacher. Formerly, I was also a teacher at a High school. I held several classes in drawing-painting, sculpting and various other skills. In the meantime I was a creative hobby creative hobby advisor at RTL TV. It was in 2008 when I first began to make miniatures. At the beginning, because of my sculpting background, I was also making human figures in 1:8 and 1:10 scale. Between the years of 2008 and 2012 I was holding several successful doll making courses for adults, too. 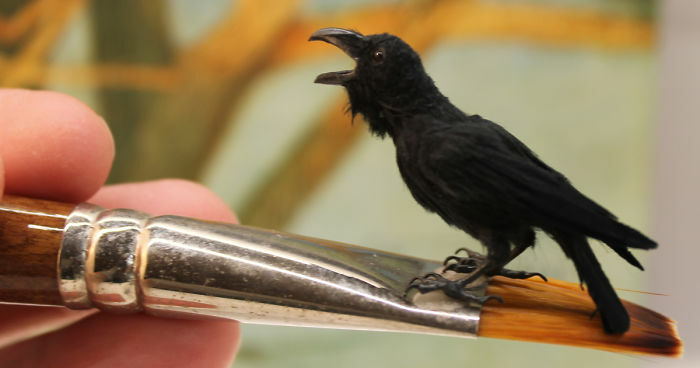 From 2012 I started making dollhouse miniature animals in 1:12 scale. Mainly birds because I love the colours of their plumage. It is a special experience to make a tiny animal. When it is done, I feel that it has come to life, is just about to make a move and fly away. Very often I get feedback from my customers that they have experienced the same when they are holding my tiny creatures in their hands. They also say that each bird has its own personality. Of course the secret lies in the fact that I take extra care when making their eyes. I use my own special techniques so that the eyes come to life. At the beginning, the making of the feet of the birds in a realistic fashion was causing me a lot of problems. After two years of trying, I have managed to develop a special technique for this, too. The toes and wings of my birds are all poseable. The materials I use ranges from polymer clay, jewelry wire, cotton threads, oil paint, art ink to pastel chalk, resin and acrylic paint. I pay special attention to cleanliness. Often a tiny spec or paint dust can ruin my whole work. So, when it is finished, I always check my work on a blown-up photo and correct it if necessary. My work represents a high artistic quality, delicate attention and lots of love. I owe special thanks to all my present and future collectors for supporting my art by their purchases. Soooo, you breed miniature animals???? A budgie!!!! I am having a cute attack!!! I am melting! So freakin' adorable!! Favorite animals.. 1: Dragonflies. 2 Hummingbirds. 3 Hedgehogs! So cute! I love your work so much! I would never be able to make this so beautiful and detailed because of my very bad motor skills. So I enjoy this post so much! I really admire your work! Made my day with this one! I think this one has to be my favorite, so precious! It's meant to be my birthstone is amethyst!!! Nobody makes a living doing bad Photo-Shop. Come on...be honest. If these are sculptures, you would show us the steps. This is just real bad PhotoShop. The budgies are just so great!!! That cute little snout! I'm in love! Life is always better when you are together! red and green macaw! wahoo! so cute! I would love one! Any of these animals! But I am too afraid I'll lose it! OMG! so f ing cute! Too adorable! I love all the birds too! But the hedgehogs are freakin' adorable!